Have you ever thought about creating your site in the interest of those with disabilities and how they would view its content? Probably not. To be honest with you, I never thought about the issue myself until recently. A friend of mine who works with those with disabilities to access everyday services that the average person takes advantage of, informed me about a service he provides which involves a complete website evaluation to determine how to make your website more accessible to those with disabilities. You could be missing out on a lot of money from customers who ordinarily would just pass by your product or service because they can’t read it due to a specific disability they may have. 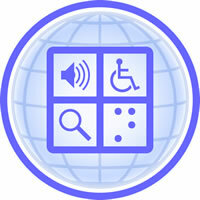 Currently, 90% of websites on the Internet are inaccessible to those with a disability. There are 54 million people in the United States with spending power of more than $1 trillion — and they all have disabilities. Imagine the lost revenue your business is missing out by not catering to their needs. Everyday, thousands of people probably pass your site because it’s not accessible to them. One large hotel chain recently made some small adjustments on their site and noticed a 110% jump in traffic and sales because of it. Those with disabilities are just as loyal to brand names and popular services as the next person, but without the proper on-screen tweaks and improvements, they won’t even know you and your company exist. There’s an easy solution to fix this problem, which effects millions of people who would normally want to purchase the same products and services as you, but cannot.